THE FORMER DIRECTOR of lending with Anglo Irish Bank, Pat Whelan, has been fined €3,000 for failing to keep a proper record of a fraudulent €8 million loan to his colleague William McAteer. 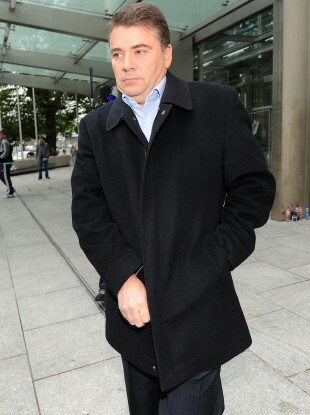 McAteer, who was director of finance in the bank, will be sentenced next week for obtaining the loan from Anglo on 29 September 2008, as the bank was on the brink of collapse. Last month McAteer (66) of Greenrath, Tipperary Town, Tipperary, pleaded guilty to obtaining a loan of €8 million from Anglo on 29 September 2008 which he secured against his shares in the bank. He then used the money to pay off a personal loan he obtained from Bank of Ireland. The court was told today the loan was formulated by Anglo’s executive board of directors to prevent the Anglo shares being sold off which would have further damaged confidence in the bank. Whelan (54) of Coast Road, Malahide pleaded guilty to an offence of failing to maintain a register in respect of the granting on September 29, 2008 by the bank a loan to another director of the bank. Judge Martin Nolan noted that Whelan’s offence was a regulatory one which doesn’t carry a custodial sentence. He said the recording of loans to directors was “of great importance” but that he was satisfied Whelan was not aware of the precise regulations. The judge imposed a €3,000 fine. The maximum he could have imposed was €12,697. McAteer, who is currently serving a three and a half year sentence for other offences he committed while with Anglo, will be sentenced next Monday. He faces up to seven years in prison and a €63,486 fine. Comments are off as McAteer is yet to be sentenced. Email “Pat Whelan fined €3k for failing to keep proper record of fraudulent €8m loan ”. Feedback on “Pat Whelan fined €3k for failing to keep proper record of fraudulent €8m loan ”.